River was already angered it was fined $400,000 and ordered to play the next two CONMEBOL games behind closed doors after its fans attacked the Boca Junior team bus heading into its Buenos Aires stadium for the meeting of Argentina's fiercest soccer rivals last Saturday. CONMEBOL made an aborted attempt to play the second leg of the final the following day and decided on Thursday it had to be staged instead on Dec. 9 in Spain at Real Madrid's stadium for security reasons. "Argentine football as a whole and the Argentine Football Association cannot and should not allow a handful of violent ones to impede the development of the superclasico in our country," River said. 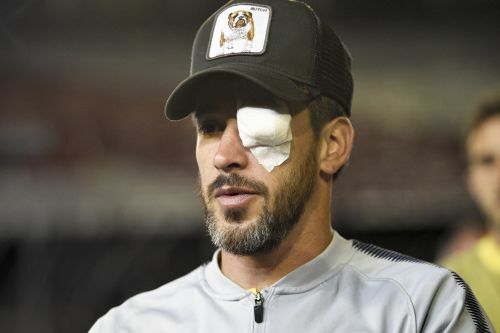 River insists it should not be held responsible for the attack that left Boca players injured, saying it happened outside of the security perimeter placed around its Monumental de Nunez Stadium. River also highlighted how Buenos Aires is currently managing to host a meeting of the world's most powerful political leaders in the Group of 20. The political summit was attended by FIFA President Gianni Infantino, who criticized the conduct of Argentine fans a week after attending the twice-postponed game. "Unfortunately there are idiots around the world that ruin the party for millions of people and we have to remove them," Infantino said. "Football creates and generates a lot of emotions. But it is a football match. It is not a war. It is not even a battle. It's not even a fight. It is a match. And what happened is no excuse and has to be condemned. However, I think we have to take, all of us in football, lessons from these happenings and make sure there was a before and there is an after the events of last Saturday and these things do not happen any longer." World soccer's governing body approved CONMEBOL shifting the final to Spain. "Not to play the game is always a defeat," Infantino said. "The only way to go ahead is to play the game in Spain." But Infantino portrayed it as a one-off decision due to the security problems, rather than being the green light for other competitive games to be moved from their natural location. It comes as the Spanish league is being blocked by its federation from moving the La Liga game between Barcelona and Girona to Miami in January. "It is an exceptional case," Infantino said of the Libertadores move. "For the rest, football is based on national associations who play their football in their countries; continental confederations who play their competitions in their continent; and then FIFA who can play its competitions everywhere."